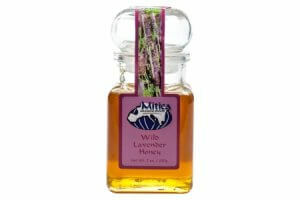 Did you know that Lavender honey is one of the popular Spanish honeys. It is a 100 percent raw honey that is made from wild lavender and harvested in the Murcia region of Spain. Wild Lavender honey is light and floral and sweet and is a wonderful combination with desserts, cheese, yogurt or add some to your tea. The lovely glass jar makes this honey an perfect gift. I just found out about this wonderful product when I was at the Food and Wine festival at Wellington Florida. The chef used it at topping on a piece of bread with little but of cream cheese, a piece of kiwi, strawberry and blueberry... it was like tasting a piece of heaven! This sweetener is a sensual delight. My favorite way to enjoy it is a mound of Greek yogurt on a salad plate with a firm, but ripe red plum sliced in half moons arranged around the outer edge in a flower petal pattern, drizzled all over with the lavender honey and a single raspberry or blackberry or 3 blueberries adorning the top. Yum! And stunningly appealing to the visual palate as well.